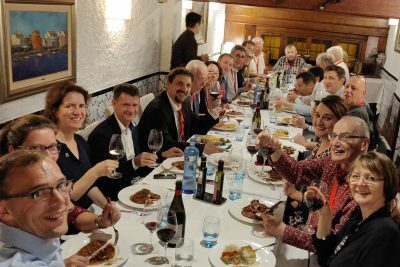 CEEC holds a general assembly bi-annually in various cities in Europe, where the many issues concerning the construction economist are debated and a number of projects promoted. Two times a year General Assembly. Visiting an interesting project in another country. Updates on the projects where CEEC is involved in. Get together with colleagues from other countries in an informal setting. From Thursday the 16th till Saturday 18th of May 2019 the CEEC will come together in Tallinn, Estonia. 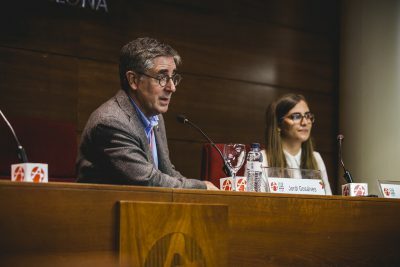 The CEEC meeting in the second part of 2019 will take place in October. 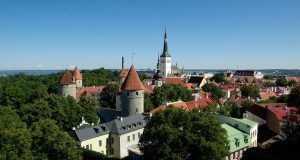 From Thursday the 16th till Saturday the 18th of May 2019 the CEEC will meet in Tallinn in Estonia. The meeting will be organised by Estonia in cooperation with member organisation RAKI from Finland. As usual the General Assembly will take place on Saturday. On Friday the 17th of May from 10.00 till 16.30 hours an interesting seminar is organised. After a welcome, Roode Liias, professor of TalTech will give a presentation on Construction Classification in Estonia, followed by a presentation on Digital transformation of the construction sector in Estonia through public sector leadership and innovation by Jaan Saar, Head of Digital Construction, Estonian Ministry of Economic Affairs and Communications. Other presentations in the morning are ‘Construction Procurement Reform in Ireland’ and ‘Collaboration of BIM and cost management through a real project’. After lunch the attendees will visit the Port of Tallinn and get an insight on the Helsinki-Tallinn-tunnel FinEstBayArea-project by Anssi Auvinen, AINS Group. One can find the full program here. Everybody who is interested in construction economics can join the seminar. The costs are 105 euro per person. To registrate for the seminar, click HERE. 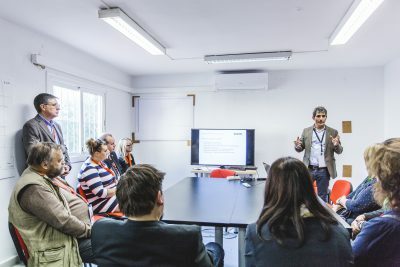 From Thursday 18th till Saturday 20th of October 2018 the CEEC was received by member organisation CAATEEB (Collegi d’Aparelladors, Arquitectes Tècnics i Enginyers d’Edificació de Barcelona). Besides the general assembly on Saturday there were interesting presentations on BIM on Friday afternoon and the attendees visited an office building project and Camp Nou. 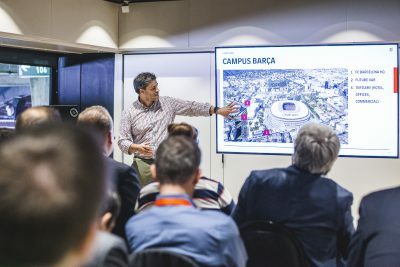 At the last one they were informed on the way BIM is used at the enlargement of the stadion premises. 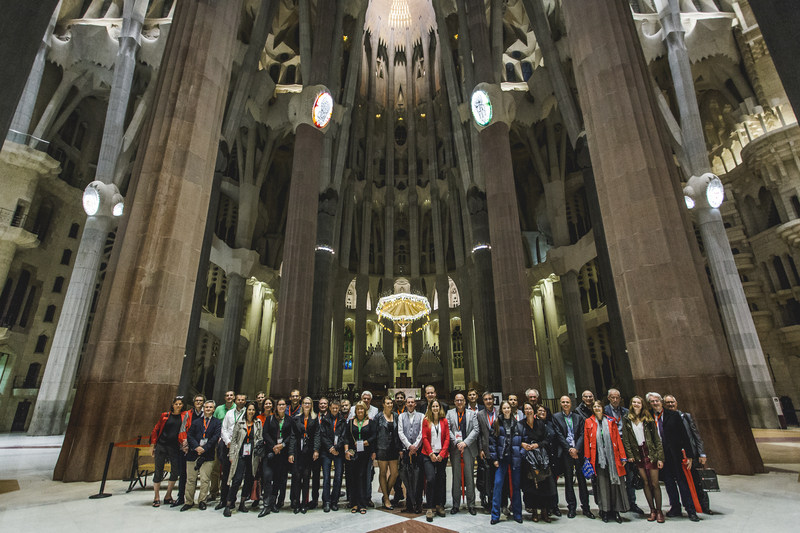 A very special and interesting part of the program was the visit to La Sagrada Familia with an introduction on the construction of the towers of Gaudi’s masterpiece. Issues of ownership of the model. Issues of responsibility for the model. Quantities output from the models are nor reliable. Quantities for cost planning and BQ’s require manual intervention. The most intense use of BIM was by developer / contractors and a client developing their own estate who had control of the BIM throughout the project life. Contractors develop BIM for quantification and estimating even where a client’s BIM has been developed. Contractors develop BIM for planning and scheduling and clash detection. This produces efficiencies on site. 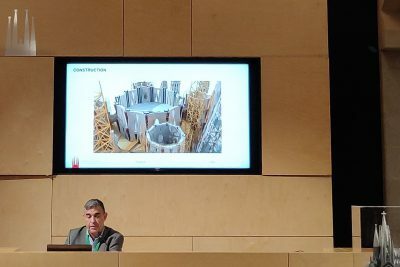 Although everyone agreed that the benefits of BIM should influence the life cycle costs, with the exception of the client developing their own estate, there was very little evidence that the BIM would be inherited by facilities management. Contributors to the conference included: Castiel Consultants, Area Patrimonial Espai Barca, Institut de Tecnologia de la Construcció de Catalunya (ITeC), Tecnics G3 S.L.P, TR Corporacion Inmobiliaria, Enginyeria I Project Management (EiPM), Grupo LOBE, Basilica de la Sagrada Familia and Collegi D’Aparelladors, Arquitectes Tecnics I Enginyers D’Edificacio de Barcelona (CAATEEB). CEEC is the European knowledge hub for construction economists. CEEC links professionals in Europe to share relevant best practises, information and experience and promotes the profession of construction economist, common knowledge and international standards. At the General Assembly György Spányi (CEO at Spanyi Partners) from Hungary was elected vice president. György takes over Vincent Arnou’s seat in the board. The delegates of CEEC met eachother in Paris from Thursday 31st of May till Saturday 2nd of June. During the first two days the delegates could attend the Untec International Congress of Construction Economists 2018, where among others panel discussions were held on ICMS and BIM. On Saturday 2nd of June 2018 the General Assembly of CEEC was held. In his welcome speech Tarmo Savolainen thanked France for hosting the assembly and warmly welcomed guests from Canada, Uganda and especially Germany. The main topics of the assembly were the future work of the CEEC, the current update of statutes and the financial status. Tarmo Savolainen led a workshop concerning the future work of the CEEC. Different groups made suggestions concerning which topics should be important to work with and how this work should be organized in the future. It was decided that the member organizations should be involved in this development to find out what they think are important topics. The statutes of the CEEC need modernization, so a new proposal from the board was presented by Agnete Skytte. This was discussed and met with general approval from the council. The suggested adaptions will be integrated before the next assembly in Barcelona. Creon Swaghoven presented the financial status. The finances are in a healthy state. The accounts for last year and the budget for the next year were approved by the council. Sadly Vincent Arnou, delegate from Untec France, stated, that because of the current work load he has to resign his position as vice president of the board before the next general assembly in Barcelona. Tarmo Savolainen thanked him for all the hard work he had put into working for CEEC in the past years and pointed out that delegates of the CEEC interested in working on the board as vice president should please come forward before the next general assembly. In October 2017 the CEEC meeting was organised in cooperation with NVBK in Rotterdam, The Netherlands. The meeting started on Friday with the seminar ‘Housing in Europe!’. After a very interesting presentation by Arjan Gooijer, architect Van Schagen Architects on renovating projects of existing apartment blocks in Rotterdam in the 1980s and nowadays, some of these projects were visited. In the afternoon delegates Gerry O’Sullivan and Tim de Jonge gave a presentation. The former presented the results of an international cost comparison of new-construction of affordable housing and the latter share some results of an interdisciplinary research project ‘Beyond the current’ about sustainable renovation measures and housing cost by a cooperation of the Utrecht University of Applied Sciences & the Delft University of Technology. At the general assembly of CEEC on Saturday Tarmo Savolainen was re-elected as president and Vincent Arnou as vice-president. Furthermore Michel Coubes was granted honorary member of CEEC by the assembly. Other issues and projets that were discussed on Saturday were ‘New members -project’, the CEGA competition, the questionary of High Rise Buildings, the new version of the CEEC Office Cost Model, the project on Quantity Surveyor Competencies and the Warehouse Cost Model. In May 2017 the delegates of CEEC met in Lille, France. At this meeting two new board members were elected. Agnete Skytte takes over Charles Mitchell’s seat as vice president of the board. Creon Swaghoven replaces Justin Sullivan as general secretary. Justin Sullivan was granted honorary member of CEEC. Also the CEEC hosted the CEGA competition for students again this year. The competition is sponsored by Saint-Cobain. The winners were awarded at Lille conference. Roger Hayes from Ireland won the first prize with his work ‘Is the lean construction theory working? A study of contracting firms in Ireland.’ The second prize went to Abdullah Noorisedah from Finland on the subject ‘Supplier efficiency evaluation in construction industry’. The prizes are worth €1500 and €1000. CEEC congratulates the students on their great work. Autumn 2016 we held the meeting in trendy capital of Denmark, Copenhagen with interesting presentations. We heard Circular Economics in the Construction Industry by John Summer, director MTHøjgaard. Sara Asmussen from Danish Building & Property Agency told us about Quantity surveying standards and methods in Denmark. Jonas Engberg, Sustainability Manager from IKEA told us Client values and priorities, including Circular Economics IKEA`s approach to circularity, and priorities regarding planned new (37.000 m2) store in central Copenhagen. Additionally we had pleasure to visit at Tivoli / central amusement park. Tivoli has make huge investments in optimizing hotel and infrastructure demands to meet the future client expectations. In May 2016 we had a effective meeting at sunny Budapest. First we heard BIM and Cost Management of the New National Gallery by Gyorgy Spanyi. He told that The New National Gallery building is designed by internationally known Japanese architects SANAA (Louvre Lens, ROLEX Learning Center in Lausanne, Samaritaine Department Store renovation on Paris, etc.) and Spanyi Partners is providing BIM and cost management. Then we had an opportunity to visit the construction of the new campus of the Central European University (CEU). CEU has been founded by George Soros, Hungarian born philanthropy billionaire (a controversial hedge fund guru). In 25 years CEU became one of the most successful graduate school in Central Europe attracting students from all over the world. The new campus project designed by Dublin- based architectural firm O’Donnell & Tuomey. Building includes several buildings including the once hotel where the last CEEC Budapest meeting was held.